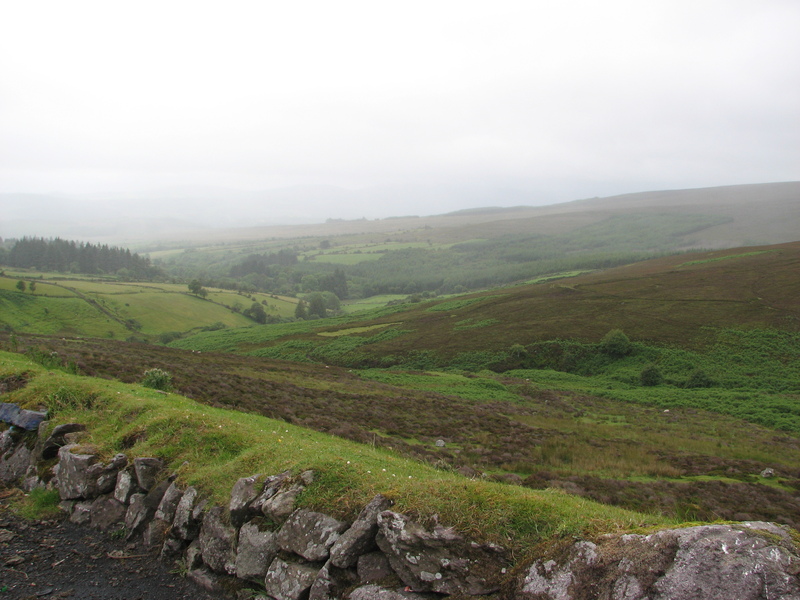 As my husband and I drove through the Irish county side, the rainy mist drew back from time to time to reveal startling glimpses of Ireland’s past. I can well believe the legends of those who have stepped into that temporal mist, never to return. In some very important ways, the past is still very much alive in Ireland. Stony ruins and oral lore share equal social commerce with internet cafes and university libraries. And yet, an exploration into Ireland’s unique history of law, religion and society reveals a world in many ways far more progressive than the future it would know. 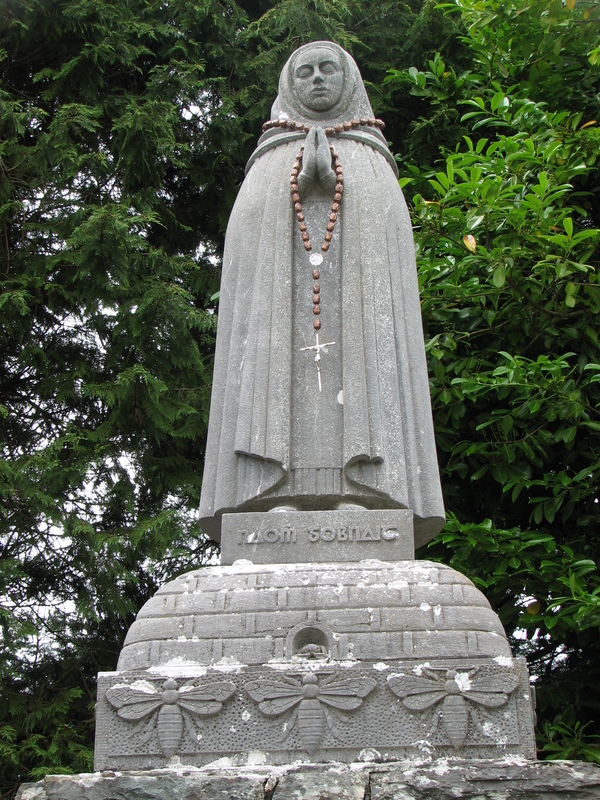 6th-7th century saints such as Aidan of Lindisfarne, Brendan (the Navigator) of Clonfert, Brigit of Kildare, Gobnait of Ballyvourney, Colum Cille (Columba) of Iona and Hilda of Whitby founded religious communities built as much from Irish pre-history as from Irish stone. They lived at a time when all that had gone before was only just beginning to be entered into written form. Transitioning from “pre-history” to “history”, law and doctrine as well as their interpretation and application had been until then a matter of oral tradition. However, Christianity was a tradition of the book, as was its religious ancestor of Judaism. Consequently, carvings and illuminations of early Irish saints frequently depict them as either holding a book or as writing in one. Not coincidentally, the first written Irish appeared in the fifth century, around the same time as the initial Christianization of Ireland. Called Ogham script, written Irish is formed of a series of grooves carved on the corner edge of a shaped stone. 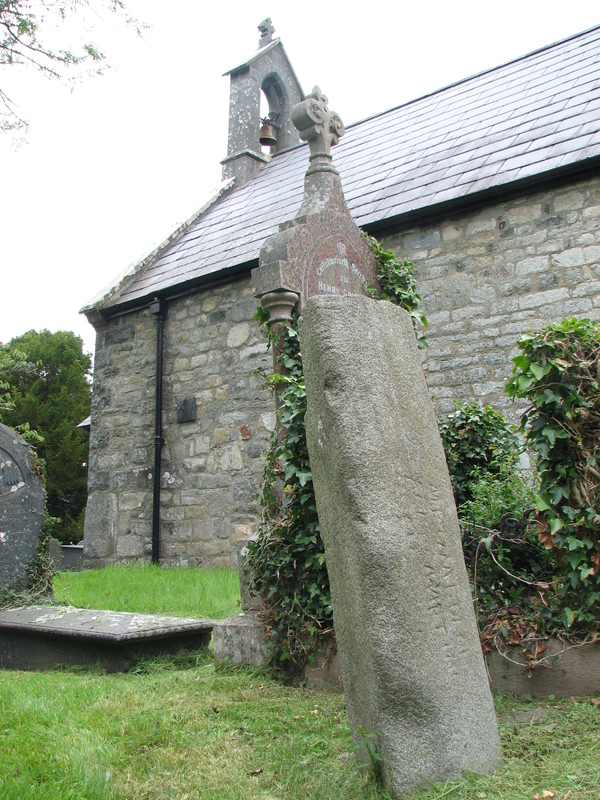 Each combination of grooves represents a different letter of the Latin alphabet, and a number of Ogham stones have been found in both Ireland and Wales. Being long before the printing press, the only way to acquire an early Christian book was to hand-copy it. 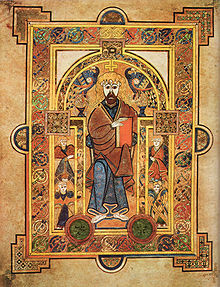 In fact, it is said that the first instance of copyright law can be traced to Colum Cille (St. Columba). As the story goes, Colum Cille was known to be an avid copyist and illuminator. His former teacher and friend, Finnian, had just returned from Rome with a highly-desirable copy of Jerome’s Latin translation of the bible created some 100 years earlier. Though Finnian was agreeable to Colum Cille studying the book, he clearly did not want Colum Cille to copy it. Finnian’s resistance seems to have been in part because the commentaries and later illuminations apparently included some gnostic interpretations and symbolism considered to be out of step with the emerging orthodoxy. Perhaps religious leaders in Rome thought it just as well to have the valuable but challenging manuscript removed from the country. 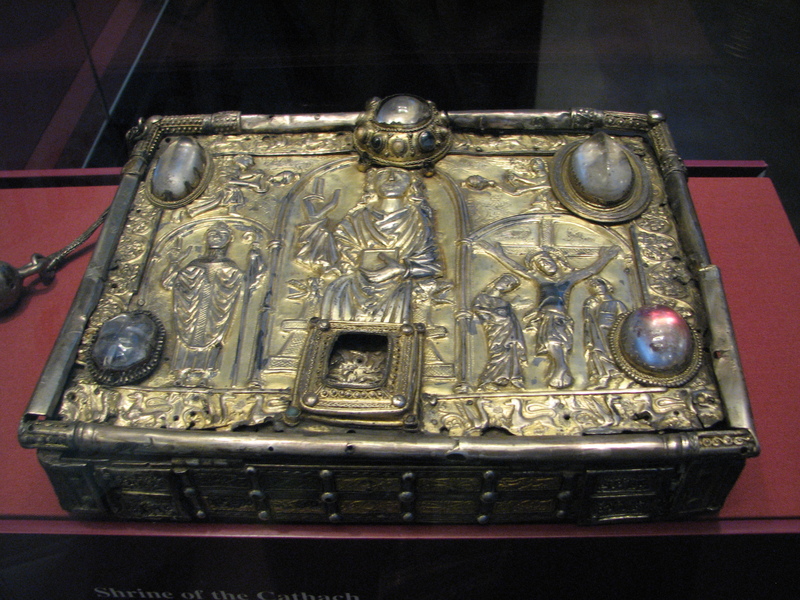 At any rate, the bible went with Finnian to Ireland, and Colum Cille wanted a copy of it. Refusing to be thwarted by Finnian’s reserve, Colum Cille copied the manuscript surreptitiously at night. Employing the practice of creating text pages from vellum (specially prepared calf skin), Colum Cille applied his art until the manuscript was fully copied. However, his secret was eventually outed, and an outraged Finnian took Colum Cille to legal arbitration in the court of Diarmaid, the High King of Ireland. Finnian argued that the book was his property and that copying it was a violation of his rights. Learned men like us, who have received a new heritage of knowledge through books, have an obligation to spread that knowledge, by copying and distributing those books far and wide. It is wrong to hide such knowledge away or to attempt to extinguish the divine things that books contain. I acted for the good of society in general. In making his ruling, Diarmaid applied an ancient oral code of legal tradition now known as Brehon Law. Within Irish culture throughout the Iron Age, Brehon Law reflected an ancient and existing social equality of gender that placed women at the head of any profession and able to hold Clan leadership equally with men. Though reflective of highly localized needs and practices, Brehon Law was the guiding force in Ireland for all relationships between individuals, social and moral. To orally agree to a social contract was binding to one’s personal honor. Any breach of contract could be seen as a mark not only against an individual but of an entire clan. Finally, Brehon Law was a tradition formed over hundreds of years by the people to serve the people. It was memorized and applied by professional arbitrators (both male and female) who studied the law for many years before being examined to become a Brehon (a combination of being a walking oral law library and legal representative). The highest level Brehons were considered to have rank equal to the High King – be that Brehon a man or a woman. From the mists of Ireland’s history emerges an early tradition of law and social conduct based on personal honor, a quality about which little is spoken or commonly culturally transmitted in our time. In the global economy and politic in which we currently find ourselves, a little old-fashioned integrity called “honor” could go a long way. My husband, The Rev. Nigel Taber-Hamilton, had a three-month sabbatical this Summer. Episcopal priests are encouraged to take sabbaticals every 5 years, even if they have to go kicking and screaming or even if they leave folks behind who are kicking and screaming about it. Since Nigel has been the Rector of St. Augustine’s in-the-Woods since 2000, this was his second sabbatical. Though I had just became Rector of Trinity Episcopal in February of this year, I was very grateful to have been able to use my two weeks of continuing education, plus two weeks of vacation in order to join him for some research and relaxation in Great Britain. We mapped out our journey based on significant remains of mostly 6th century Celtic Christian communities. Consequently, our trail wandered from north to south Ireland, to Wales, England and then to Scotland. Being good pilgrims, we saw many holy sites and did a great deal of shopping – a fine pilgrim tradition, don’t doubt it. We also saw many things we hadn’t planned on seeing such as cows larger than most economy cars, the mummified remains of several “bog people,” and the slanted view of an Irish dirt road from the perspective of the Irish dirt-road ditch we drove into. 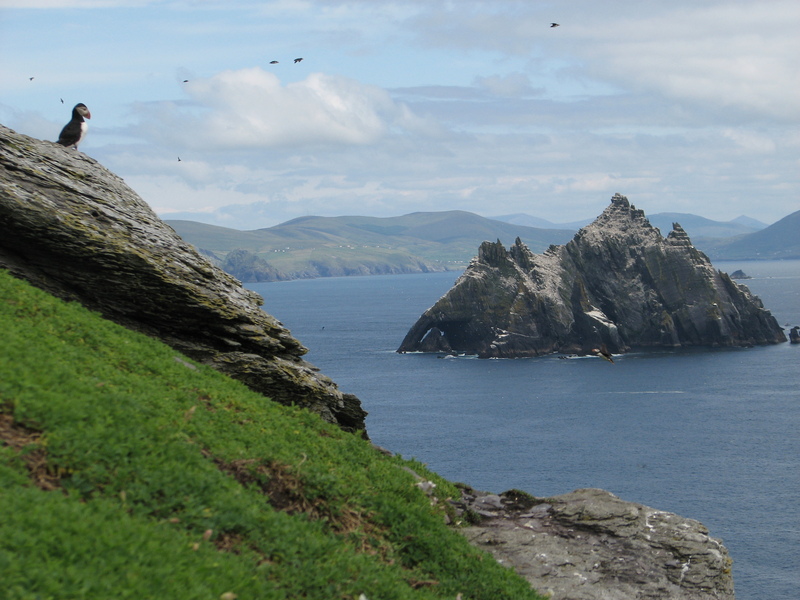 A place that I hope to remember for the remainder of my life are the two Skellig islands off the Iveragh Peninsula in Country Kerry, Ireland. Little Skellig is closed to the public, since it is home to the second largest colony of Northern Gannets (seabirds) in the world. 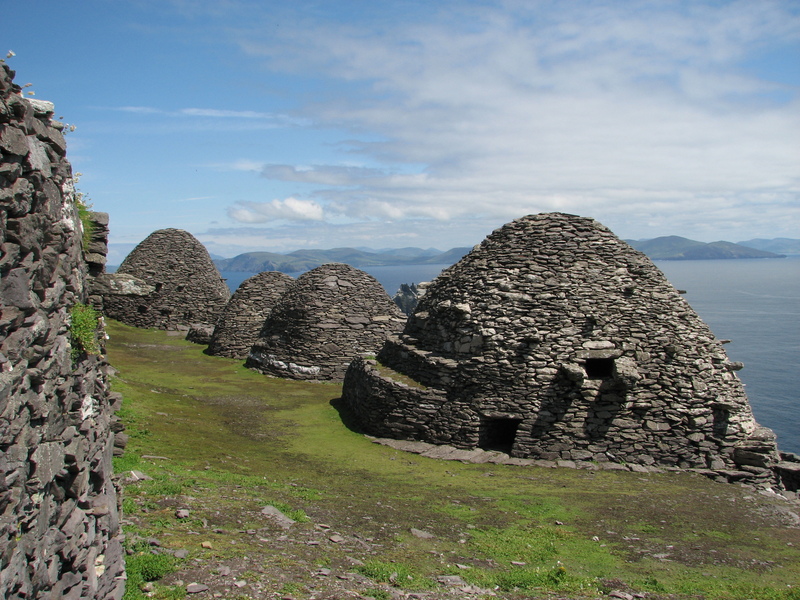 The second island, Skellig Michael, serves as a popular nesting ground for puffins and is also designated as a World Heritage Site for its the remains of 6th century monastic community perched at 160 meters above sea level. The remains of the site include beehive shaped oratories (monastic cells built of stone) and a church. St Michael’s Church is rectangular in form, unlike the oratories, and would originally have had a timber roof. The date of the founding of the monastery is not known. However, there is an oral tradition that it was founded by St Fionan in the 6th century. It was dedicated to St Michael somewhere between 950 and 1050. The site was occupied continuously until the later 12th century, when several factors caused the community to move to the mainland. It is likely that the community was very small, perhaps around 6-8 monks lived on the island where they kept a small kitchen garden and harvested fish and eggs for food. The park interpreter assigned to the island the day we were there shared that the monks didn’t come to the island so much to get away from civilization, but rather to live on the edge of the known world in order to be closer to what was beyond it, namely – heaven. 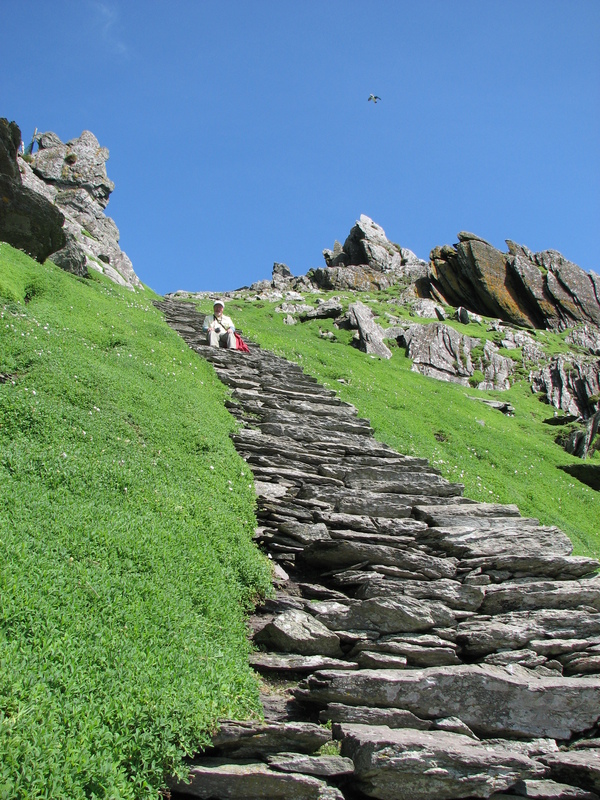 Skellig Michael was held to be a “thin place,” a place nearest the realm of the Sacred. 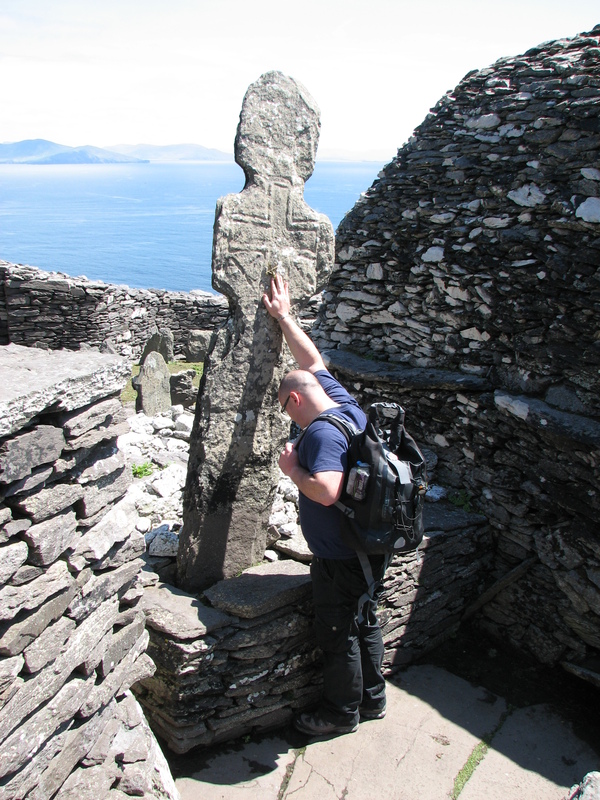 After a 50 minute boat ride and climbing 650 terraced flights of rock-shelf steps, Nigel and I reached the monastic site. The temptation to slip into a romantic reverie on how wonderful it would have been (would be) to live a simple life on the island was tempered by the awareness that a good gust of wind on a rainy day could quickly end one’s prayer life on this side of the Divide. Yet, coming to the edge of the world and of life can bring a helpful, even needful, perspective to decision making and prioritizing one’s time, choices and energy. 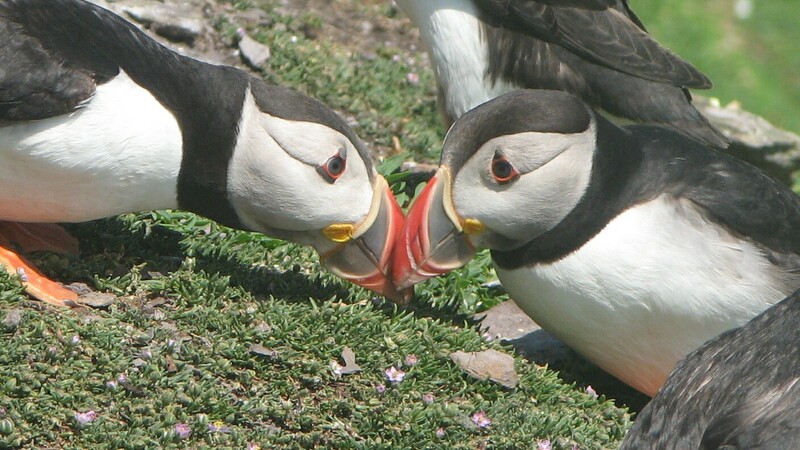 The puffins play and nest on the sheer sides, you know. After a good beak-wrestling contest and tumble down the soft ground foliage, they fly away to eventually settle down again. It’s not scary to them; it’s a familiar home. What Skellig Michael reminds me of is that the distance between the life we have and the life we may want to have is not a matter of distance traveled or summits climbed but a matter of attitude, not altitude. How we orient ourselves within a given moment or situation can diffuse danger, focus priorities and redirect us to new heights and perspective.